I’m a couple of days late on February’s second challenge for the Barefoot Bloggers, but to tell the truth I think I might have been even more late if this dessert hadn’t turned out so spectacularly well – I just couldn’t wait to tell you all about it! 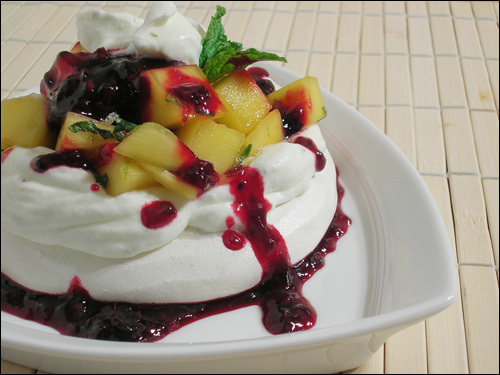 Ina’s Meringues Chantilly, chosen by BMK of Reservations Not Required, are composed of a simple vanilla meringue base topped with orange-scented whipped cream and stewed mixed berries. Certainly a lovely combination on their own. But in my part of the world, its still winter, and not only are berries not exactly at their best right now, but I’m in desperate need of food that evokes memories of warmer weather if I’m going to make it to spring without a serious case of cabin fever. So, I opted to take a more tropical approach to this dish, and man oh man did it work. I followed Ina’s directions for the meringues (which, from past experience and a lot of research, could use some clarification in parts – there’s an awful lot of subtlety involved when making meringues, and her recipe as-written doesn’t address a lot of the more common tips and tricks and pitfall advice that I’ve seen in more thorough recipes) though I only made a half batch. For flavoring, I replaced the vanilla extract with coconut and ground up a 1/4 cup of Just Tomatoes brand dried mangoes in my coffee grinder to mix with the sugar that would be added to the egg whites. If you’ve never had Just Tomatoes dried fruit, I really recommend checking them out – these aren’t soft, chewy dried fruit like you normally find in the grocery store. They’re crisp and crunchy with no moisture left in them at all, with an intense fruit flavor that you just can’t get otherwise. (If you’ve ever had Special K Red Berries, think about what the strawberries are like – that’s basically what these are.) They can be eaten out of hand or added whole to other things (cereal, yogurt, oatmeal, or baked goods come to mind) but what I’m starting to experiment with is grinding them up to make intense fruit powders. Imagine mixing dried raspberry powder with ground coriander and ginger to make a spice rub for pork, or shaking up some strawberry powder with aged balsamic and olive oil for a super smooth and flavorful salad dressing, or stirring some peach powder into white chocolate ganache for truffles. The possibilities for applications are endless, especially considering the variety of fruits and even vegetables on offer from the company. Don’t get scared off by the price – the potential for unique and creative recipes is endless. The ground mangoes were absolutely perfect here – after the meringues had their long slow bake and even longer drying time in the oven, the mango flavor had intensified and bloomed, yielding a crispy airy bite with the unmistakable sweet-tart flavor of mango and a subtle aromatic whiff of coconut underneath. Some of my meringues came out a bit chewy in the middle, which I think was partially caused by a slightly truncated bake time (forgot to set my oven timer at first and had to guess to make up the time) and some difficulty whipping the egg whites to their proper soft peaks. I really think that Ina has you add the sugar too early, and that the use of regular granulated sugar was a mistake – it was too heavy and weighted down the meringue so that no matter how long I beat it, it never got quite stiff enough. That’s why my meringues didn’t come out with those nice ridges as well, despite being piped with a star tip – once they hit the heat, they couldn’t hold their shape (though at least they didn’t spread much). No matter, the flavor was perfect and that’s the post important thing, especially since they would just soften up later anyway under the fruit and cream toppings. To go along with my tropical mango meringue shells, I decided to make a pair of fruit toppings: a very simple blackberry sauce made with a half-pint of blackberries (the only kind that looked good at the store), a bit of white sugar, some lemon juice and lime zest; and a fresh mango salsa dressed with lime juice, brown sugar, and some fresh basil and mint cut in a chiffonade. The whipped cream topping also got a hit of lime zest and a tiny splash of coconut extract to bring the whole thing full circle. 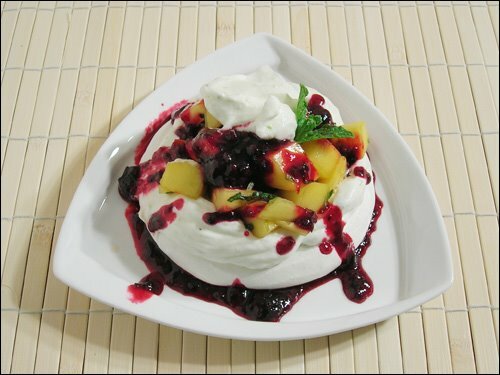 I assembled them as per Ina’s instructions – a dollop of blackberry sauce on the plate, spread out a bit so it’d peak out beneath the meringue that was set on top of it. 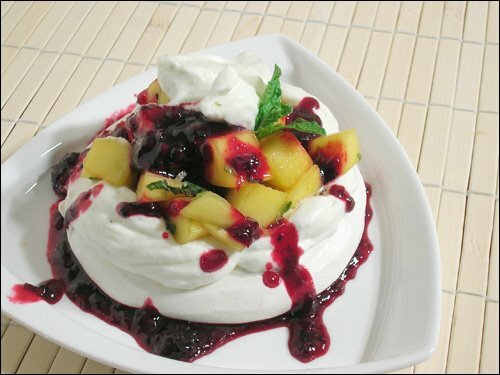 Top the meringue shell with a dollop of whipped cream, then a big spoonful of the mango salsa and another drizzle of the blackberry sauce. Finish with a small spoonful of whipped cream and some fresh mint, and dessert is served. This, people, was the best dessert I have ever made in my life. I’m calling this restaurant-worthy. The combination of flavors was exactly what I wanted, tropical and summery and reminiscent of a hot day in the Virgin Islands, with a nice balance of sweet and tart, verdant herbs and bright citrus, aromatic fruit and creamy dairy. 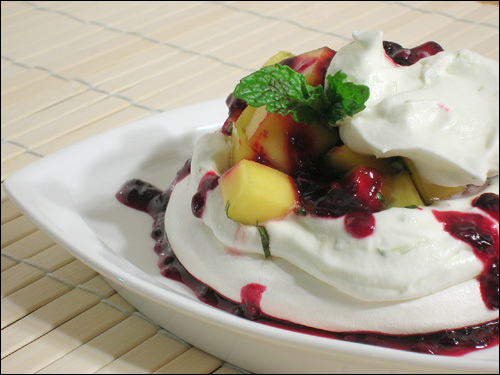 The interplay of textures was exciting – slightly crisp meringue becoming chewy and toothsome under the fruit and cream, tender sweet morsels of mango, smooth cool whipped cream, slightly crunchy seeds in the blackberry sauce. Totally perfect. I do think it tended a bit too much to the sweet side of things, which I would remedy next time by cutting down on the sugar in the meringues, the blackberry sauce, and the cream. The mango in the salsa was also a bit underripe so it wasn’t as soft and juicy and intense as it would be in the summer. But even with those small shortcomings, this was excellent. Mouthwatering. Craveable. Totally deserving of a spot at the end of a fancy dinner party, or as a regular offering on a restaurant menu. Honestly, it’s THAT good. And I get to have it again tonight. This entry was posted in Food, Drinks and Cooking, Table for Two? Archives and tagged barefoot bloggers, cheese/dairy, desserts, eggs, fruit. Bookmark the permalink.